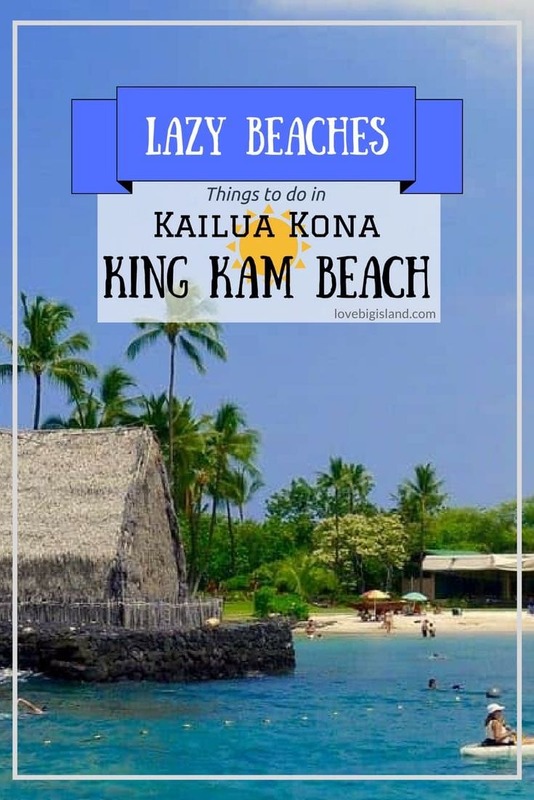 Kamakahonu is also know as King Kam Beach or Kids’ Beach. 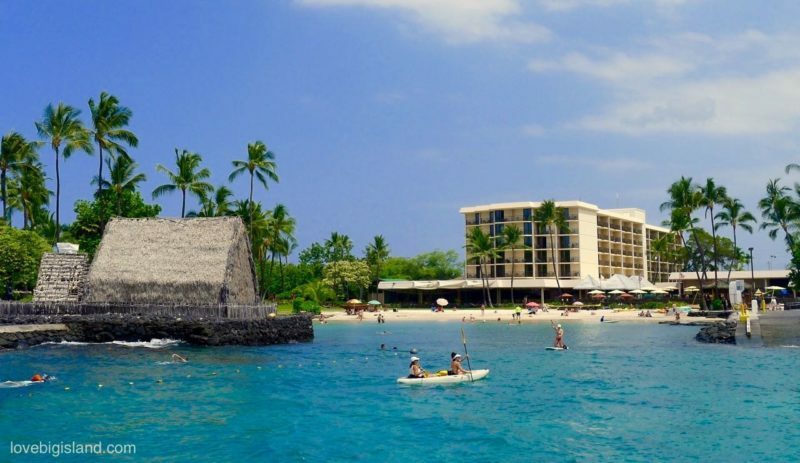 It is a small beach most suited for snorkeling and sunbathing in the heart of Kailua Kona. You can find Kamakahonu between the Kailua pier and the King Kamehameha hotel right on Alii Drive. “Ka Maka Honu” means “the turtle eye” in the Hawaiian Language. Unfortunately, the rock that gave the beach its name has now been covered by the Kailua pier. Kamakahonu beach is very sheltered (there is almost no wave action) and is fronted by some white sand and grass. This makes it a very convenient stop for any vacationing family with small children. 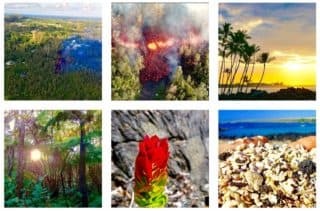 Kamakahonu has much to offer to mature visitors as well. It is a popular spot for snorkeling, dive instruction, canoeing, and swimming. The on site beach shack rents out snorkeling gear, Hobie Cats, and kayaks, all at reasonable prices. For snorkeling, swim out of the bay and turn right. Do not go to the left since this area is often used by boats going to and coming from the pier. King Kam beach is the perfect ‘in between’ stop to take your young family or to go snorkeling. It is not a beach you should plan your day around, but great for a little swim or snorkel before or after your daily activities. For the early birds, few times are better for snorkeling that at first light! The ‘Ahu’ena Heiau (temple of the burning altar) is the sacred Hawaiian temple where King Kamehameha I spent his last seven years in power before his son Liholiho succeeded him. It was reconstructed in the 1970s and can be viewed from the outside. If you are interested in the temple, make a stroll to the hotel lobby to see some of the artifacts from the temple on display. Kamakahonu Beach is on the north of Kailua Bay. Follow the in front of Ali’i drive to the north (keep the ocean on your left hand) and walk to the pier. 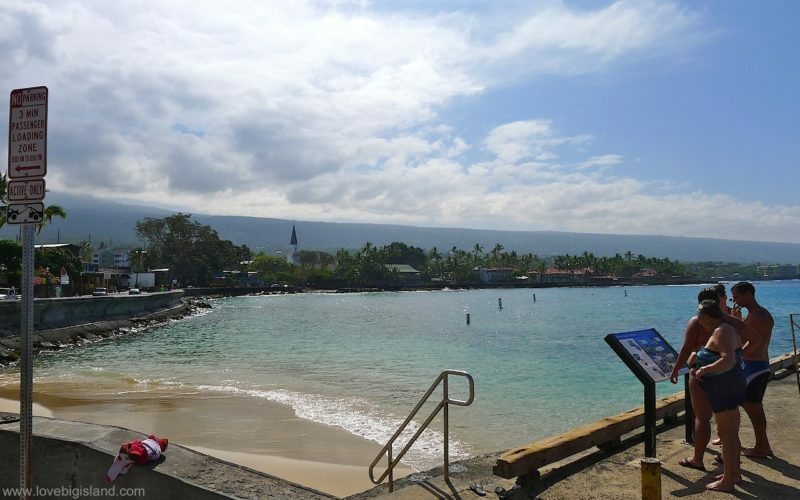 The beach is directly behind the pier in front of the King Kamehameha’s Kona Beach Hotel.